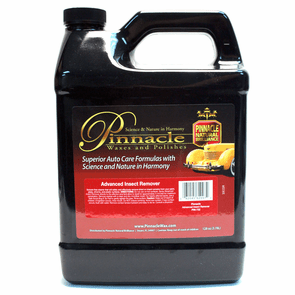 Home > Shop by Brand > Pinnacle Natural Brilliance > Pinnacle Advanced Insect Remover - 128 oz. Breaks down bug remnants chemically for less scrubbing. Bugs don’t have the guts to challenge this cleaner! Pinnacle Advanced Insect Remover is one of the safest options to removing those annoying hitchhikers that latch onto your car’s perfect finish. Pinnacle Advanced Insect Remover handles this with a unique blend of cleaners in place of harsh solvents or acids. Thus, providing you with a powerful cleaner that rarely requires any physical effort. Plus, Pinnacle Advanced Insect Remover is safe on your paint, glass, chrome, plastic surfaces, or just about anywhere you find a bug trying to hitch a ride. It’s a safe bet that insects aren’t going to go extinct, and for good reason, they are a necessary part of our ecosystem. However, most detailers may not agree with that! Once that bug has made impact with your paint, the acidic residue from what’s left from our flying friend starts to eat away at your clear coat! The harsh reality is that you’ll never be able to keep them off your paint finish, but you can use the proper product to make sure your hood isn’t their final resting place! Pinnacle Advanced Insect Remover is designed specifically to breakdown whatever is left of those unwanted passengers. The best part of it is, Pinnacle Advanced Insect Remover does all the hard work for you! The special blend of cleaning agents breaks down the remnants chemically and that translates to less scrubbing. Simply spray Pinnacle Advanced Insect Remover onto the affected area, allow a few minutes of dwell time, and rinse away! So what sets Pinnacle Advanced Insect Remover apart from other insect removers? Well, the formula of course! Many other options on the market rely on solvents or acids to get the job done. Those ingredients can cause more harm than good. Those bug remains are already leaving an acidic reside that we know is hurting the clear coat, so why would we want to put an acidic product on top of that? Pinnacle Advanced Insect Remover was made without the use of those harsh chemicals to make sure your clear coat is not only clean but preserved as well. Do not use in direct sunlight and ensure surface is cool to the touch before use. Spray Pinnacle Advanced Insect Remover directly onto the surface. Allow product to dwell for 3-5 minutes. For neglected or severe cases, some agitation may be required with the Pinnacle Safe Scrub Bag & Tar Pad.